Phoenix Project would not be what it is if it was not for the planes, cars and guns! Below you will find information on each aircraft. Some you have never heard of and some will be old friends... enjoy! 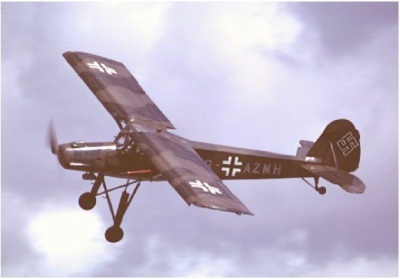 Click on the pictures for more information on these aircraft. The Storch is what ties everything together in the book. This was the helicopter before there were helicopters. It could land within its own length and take off in under 150 feet no wind. Now, if there was... say a 20 knot head wind, one could take off vertically! If you wonder how it feels to fly in one... click on the picture... sit down and enjoy the ride! Click on picture for great vedio of the Germans helicopter program. It was way ahead of the prototype stages of helicopter program in the United States. The Autogiro, my favorite flying machine and prominently featured in the novel. Pitcairn PA-19 Cabin Autogiro was the largest American Autogiro built. Four were constructed, two stayed in the US and the other two went to the UK, but it failed to find a market due to the Depression. 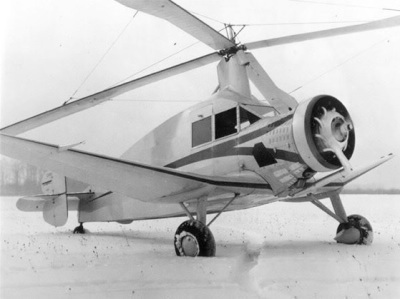 In 1932, while at the Pitcairn-Cierva Autogiro Company of America, Robert B C Noorduyn was responsible for the design of the first enclosed, of this four/five seater Autogiro. Luckily, I sourced out some original plans for this aircraft which I plan to frame but unfortunately I have no wall space! It had a Wright R-975E-2 420 HP radial engine, 90 gallons of fuel and 8 gallons of oil. I consider these conventional Autogiro (conventional meaning engine up front) the safest way to fly. Click picture to see the only PA-18 Autogiro left flying in the world. There is a company that has done a beautiful job in creating a modern enclosed Autogiro called Phenix Aero . We are introduced to Max, our hero, as he is flying the SA-38B through a series of test for the NAVY. The history of why this plane was made is a very interesting one. Schweizer originally converted their famous sail plane, the Schweizer 2-32, into a covert reconnaissance plane for the military skunk works program during the Vietnam conflict. It became the QT-2PC. I was lucky enough to fly one of these rare aircraft when I went to College in Colorado. The particular 2-32 I flew had been restored to its original sailplane configuration. Even though it lacked all the ‘Sunkworks’ additions it was an honor to fly it. This particular 2-32 is still in operation out of Boulder Colorado. 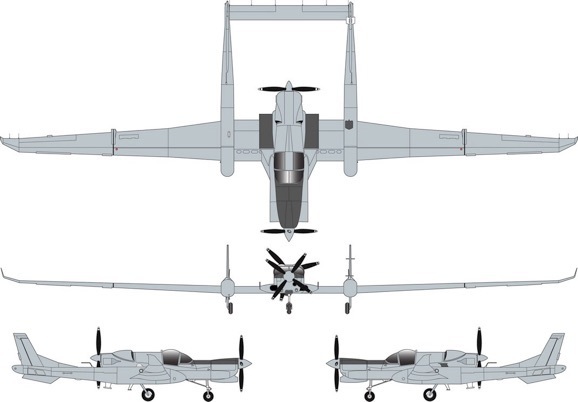 The QT-2PC did so well that they decided to continue and improve on the design which lead to the Condor, a single engine surveillance plane. Eventually they built a center thrust configuration twin (RU-38B) which they still manufacture. It is a very interesting plane and one that I would have volunteered to fly if I every had the chance. Originally it had typical piston aircraft engines until the company further improved the aircraft by replacing the engines with two Rolls Royce Allison 250-B17F turboprop engines which allowed raising the gross weight to 7200 lbs (3265 kg). This new aircraft carried the military designation of RU-38B. Schweizer aircraft company was eventually bought out by Sikorsky and the Condor became the SA-38B. The engines were then replaced with two Pratt & Whitney PT6A-34A turbo props. The SA-38B has 140 cubic feet (4.1 cu m) of payload space with a payload weight of 800 lbs (363 kg) available. The payload bays all have large access doors and are located both in the tailbooms and also behind the pilot and co-pilot seats in the fuselage. The latter space can also accommodate a third crew member, if required. Using pallet-mounted sensor packages the aircraft can be quickly changed from one mission to another. The piston version was able to achieve quiet operation while loitering by using a propeller speed as low as 1000 rpm. This is possible because the sailplane-derived wing is efficient and flight at low airspeed can be sustained with low power.